Whether you’re looking for a poster as a gift to give to someone or something to hang on your wall, the following are some of the geeky arts and posters you’ll absolutely love! From posters about games, star wars fans, developer, engineers, and so much more. Scroll on below to choose that suits your taste and style of bedroom. If you’re looking for a gift as well, the following are great examples! Especially if you’re planning to give it to a geeky friend, or simply to show appreciation. Engineers are not entirely bad at math. And yes, cross those misspellings out. If you’re a proud engineer, post this on your bedroom! It’s simple, sarcastic and awesome. It’s a perfect gift for any aspiring engineers out there as well. A unique illustration of a geeky bear. Perfect for a white-themed room. If you’re a lover of animal posters, we have an illustration of a white bear with geeky glasses for you! It’s a perfect gift for any animal lover as well. Don’t miss this poster if you want to have a cool, neat and minimalist looking room. Computer is life. Display this beside your computer in your bedroom, and it’ll look perfect. Whether your daily life is about coding, or you simply need a computer in your life—add this to your wall room. It’s simple, yet it shows the geeky side of you. Geek, geek, geek.And yes, we need glasses. Even if it means a glasses poster. Have this on your bedroom wall, and it’ll look suitable with any type of color. It has a touch of modern design which is perfect for any style of the room. If you’re a fan of Rick and Morty, this is a must! The illustration has a beautiful feel of the galaxy, along with Ricky and Morty appreciating the view. With a touch of the universe and Ricky and Morty, it’s no doubt is one of the must-have geeky posters. Make one of your favorite games your bedroom poster. The journey is definitely one of those that are a must-have. The journey has been known for its beautiful graphics and soothing music, it has one of the breath-taking views that we can ever encounter in video games. With this, why not display it as one of your bedroom posters? Remind yourself the awesomeness of Journey with having this in one of your collections. For editors and writers, keep calm and proofread! Yes, sometimes we do get addicted to grammar. Especially for those grammar nazis, having this poster in one of your bedroom walls and get motivated to proofread! Some people need you out there, the grammar warrior. If you’re a gamer, you definitely one of these posters. There will come a time when we go rage from time to time when playing games, especially when losing, but thanks to this poster! One glance, and we should keep calm and game on. Do our best, and defeat every boss battle! For Star Wars fan, this is for you! If you already have a collection of star wars movies or games, why not have a bedroom poster? 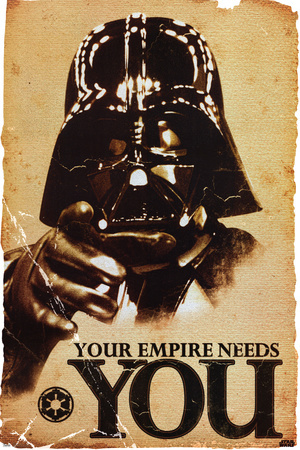 Your Empire Needs You poster is one of the Star Wars collections you simply need to have. We can never go wrong with having a poster of cats, specially designed with an atom. And yes, if you have a beloved cat as well, this poster is a must! The frame comes with varieties of colors that are suitable for your wall paint. Do you have any more ideas for a perfect room decor? May it be geeky posters and other room decors, you can tell us more about it below!